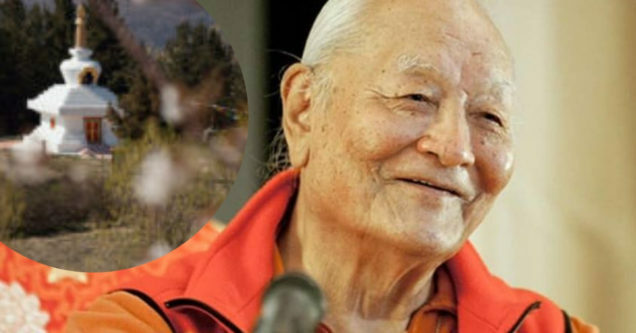 Se realizará una breve ceremonia para decirle adiós y honrar al Maestro Namkhai Norbu, inspirador y fundador de la Comunidad Dzogchen, quien dejó su existencia terrenal el 27 de septiembre del 2018. Un representante de la Comunidad Dzogchen dará una breve despedida en nombre de los miles de estudiantes del Maestro de cada lugar del mundo. Todos Sus discípulos cantarán un antiguo canto enseñado por el Maestro y practicado mucho en la Comunidad Dzogchen, para encontrarse en un momento de familiaridad y meditación. Los invitamos a todos a compartir este momento. A brief ceremony will be held to say farewell to and honor Master Namkhai Norbu, the inspiration and founder of the Dzogchen Community, who left this earthly existence on 27 September 2018. A person of great spiritual significance, he knew with great sensitivity and wisdom how to place himself at the service of others, showing thousands of people the path of awareness. A representative of the Dzogchen Community will give a brief farewell on behalf of the thousands of the Master’s students in every part of the world. All of His students will sing an ancient song taught by the Master and practiced very much in the Dzogchen Community in order to find themselves in a moment of kinship and meditation. We invite everyone to share this moment. You can also follow the ceremony on live webcast.